Jan Medland won a bronze medal today, here in Sarasota...played very well in the heat....16 games in all...great to watch. Participating in the Advanced Women's Category was Susie Keast who came away with the BRONZE. Participating in the Intermediate Women's Category were Gillian Mayne, Rosemarie Wickens, Pat Ellis and Jean Grummett. Gillian and Rosemarie, were persistent throughout and earned themselves the Silver Medal. Excellent job! Pat and Jean were pleased that they weren't whomped completely and were able to come out with two wins and two losses. Well done! Participating in the Men's Intermediate Category were Bev. Johnston(TCP) and his partner Percy Harvey (BMPC) who played some close hard fought matches coming out on top with the GOLD while Alec Svoboda (TCP) and his partner Brian Campbell came in second with the SILVER. Eric Newman (TCP) and his partner Brian Bell pulled off a third place finish (BRONZE) while Rob Johnstone (TCP), Paul Clements(TCP) came away with two wins and one loss. ​Well done to all the participants for their great efforts! ​ in Mildmay, Sunday June 3, 2018 . From Left to Right: : Percy Harvey BMPB, Harry Stevens BMPB & TPC, Jo McLaren TPC, Deb Harvey BMPB, Rob Johnstone BMPB & TPC, Eric Newman BMPB & TPC, Rosemarie Wickens TPC & BMPB, Rick Bryla TPC and Jean Grummett, TPC. Percy Harvey, BMPB and Rick Bryla, TPC play against Harry Stevens, BMPB & TPC, and Eric Newman, BMPB & TPC in one of their matches. Congratulations to you all and Good Luck on Friday! Rick from the Thornbury Pickleball Club got to meet Prem Carnot - the Pickleball Guru - 5.0 player who travels the world giving clinics, lessons and everything else ! Nicest guy you will ever meet ! 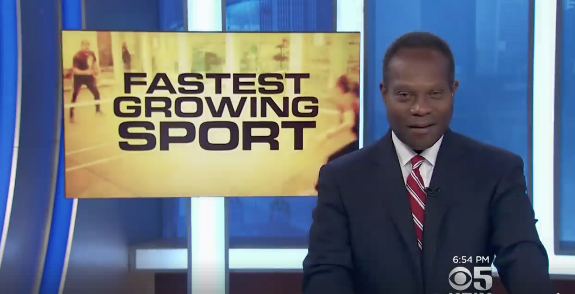 ​"Promoting the sport we love ! Our snowbird club did an article on us !" 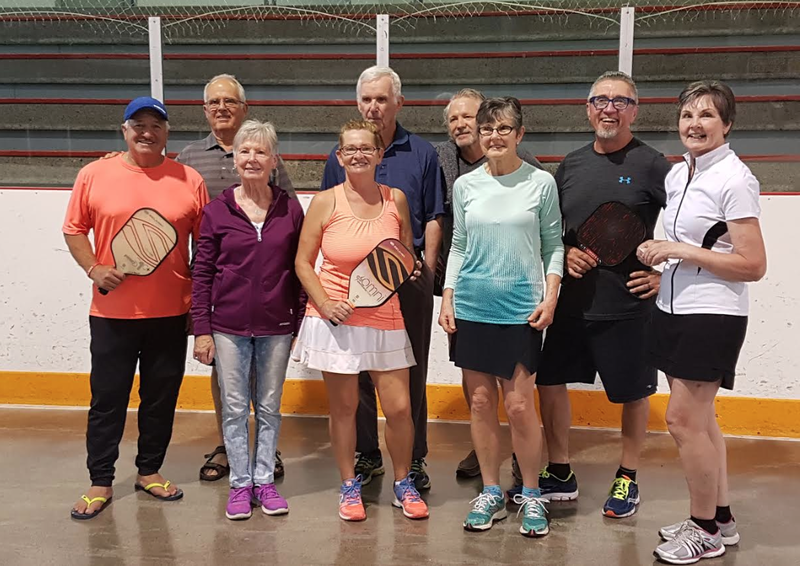 The Blue Mountain Pickleball & Thornbury Pickleball Clubs sponsored this NATIONAL PICKLEBALL DAY at the Beaver Valley Community Center Saturday, August 12. Pickleball Canada was promoting in conjunction with ParticipAction, all Pickleballers across Canada get out and play and celebrate our great game. A number of our community members came to play and find out a little more about the game with the strange name! 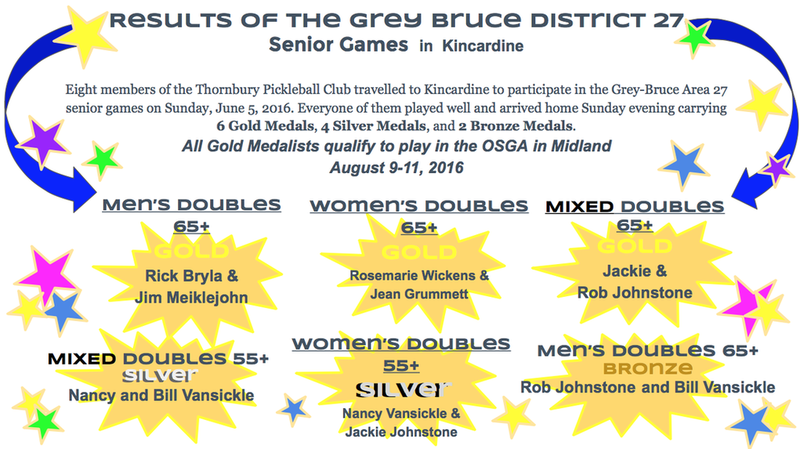 Congratulations to the five TPC participants who travelled to Kindcardine to compete in Ontario Senior Games Competition. Rob and Jackie Johnstone held on to their Gold Title earned last year in Mixed Doubles 65+ while Harry Stevens and Rosemarie Wickens won Bronze. 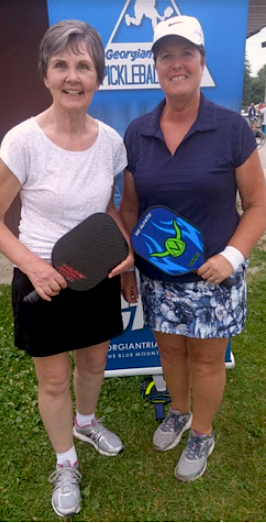 Rosemarie Wickens and Jean Grummett also won Gold in Women's Doubles 65+ retaining their title from last year. ​ Mark Renneson, Third Shot Sports at the Thornbury Community Centre, Thursday afternoon. Besides learning the fine points of a legal serve and the non-volley zone, we also learned reasons behind Mark's Terms - 'Serve &Stay,' 'Return & Run,' 'Go for the sitting Duck!" 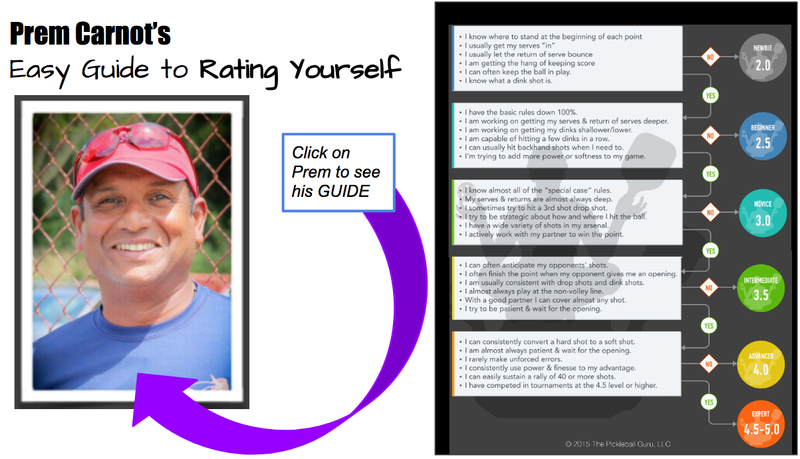 We are so lucky to have a PB coach, like Mark, who lives nearby and can share his knowledge and expertise, as we learn more about playing pickleball. winning two bronzes on Friday, May 12 and going for more hardware today, Saturday May 13. Our two teams - Rick and Shirley & Alec and Sue won bronze in their divisions yesterday. 3:58 pm - Alec won a Silver medal in men's doubles - Way to go Alec! 4:17 pm Mark Renneson is playing in the gold medal match right now. ​He won silver and then won 2 more! ​Could this happen in the Town of the Blue Mountains? 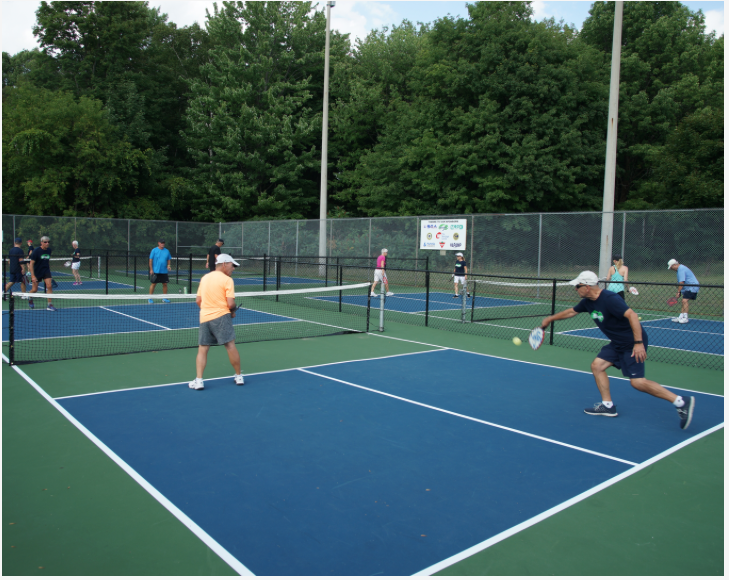 Midland in the Heart of Georgian Bay is on fire with the growth of Pickleball for residents interested in healthy, active living. The area has become a pickleball destination attracting visitors and new residents. 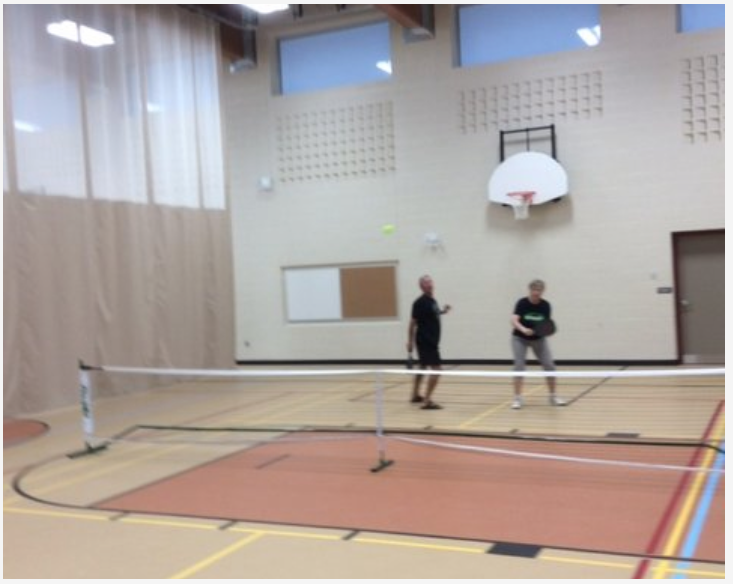 The Askennonia Senior Centre, the YMCA and the Midland Area Pickleball Club each offer pickleball three times a week. The dedicated outdoor courts at Tiffin Park have received rave reviews. See photo. 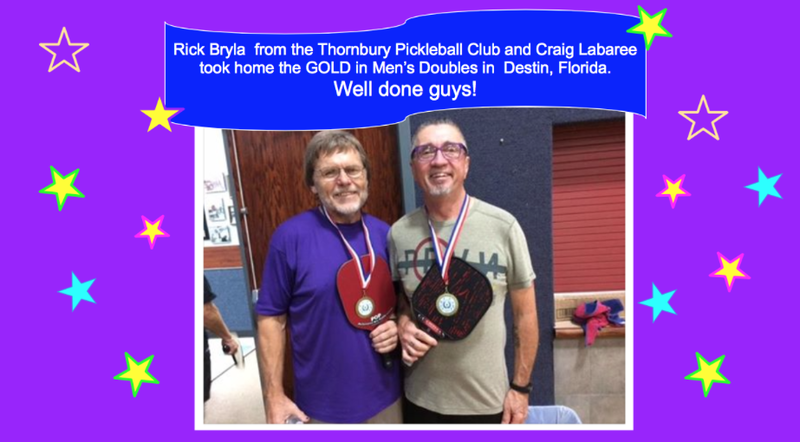 Rick Bryla wins GOLD in Mixed Doubles Competition. ​Rick Bryla from the Thornbury Pickleball Club proudly showing his silver medal won today. He and Ronnie did really well and were up against some very strong contenders on the Gold medal round. Well done Rick and Ronnie !! Yes, pickleball and tennis can thrive and flourish together! 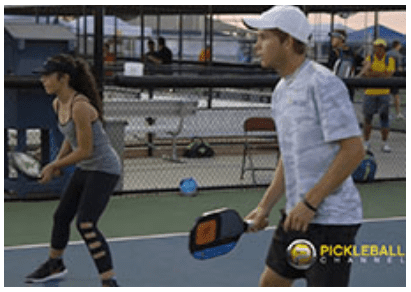 At the world renowned Bobby Riggs Tennis Club, owners and tennis pros Steve and Jennifer Dawson decided to add pickleball to their tennis club which not only added revenue to the organization but has enhanced the community and members’ experience. Watch a heartwarming story about this tennis club and how the Dawson family took a chance on pickleball and ended up completely embracing the sport. 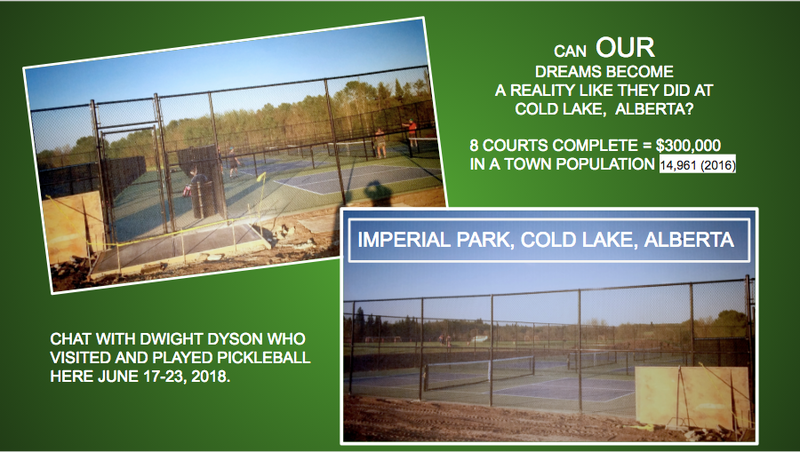 The Dawsons aren’t planning on giving up tennis, but by adding pickleball, they’ve given their tennis club new life and have created a unique community that opens doors for additional opportunity and community for BOTH sports. Overheads, volleys and even around-the-post shots!! 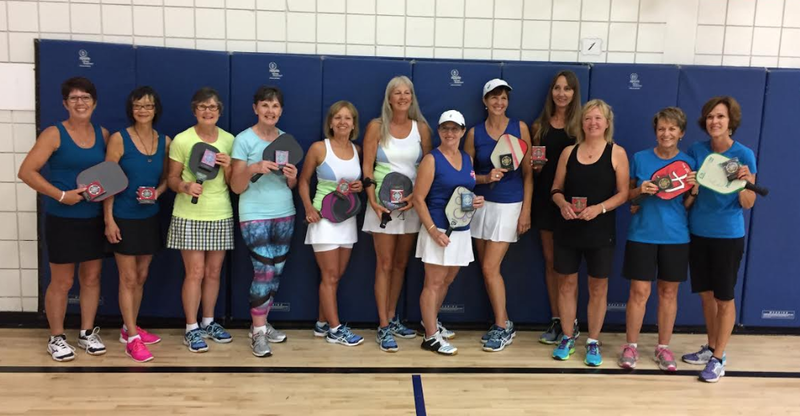 A new generation of pickleball players is evolving the sport of pickleball. And let me tell you, these kids are good! Check out this video from USAPA Nationals VIII where some impressive gameplay happened in the juniors division – and you get a front row seat to all the excitement! The play is fun with some impressive shots, and even the Pros got involved. We’ve also included some slow mo so you can really see these kids in action. 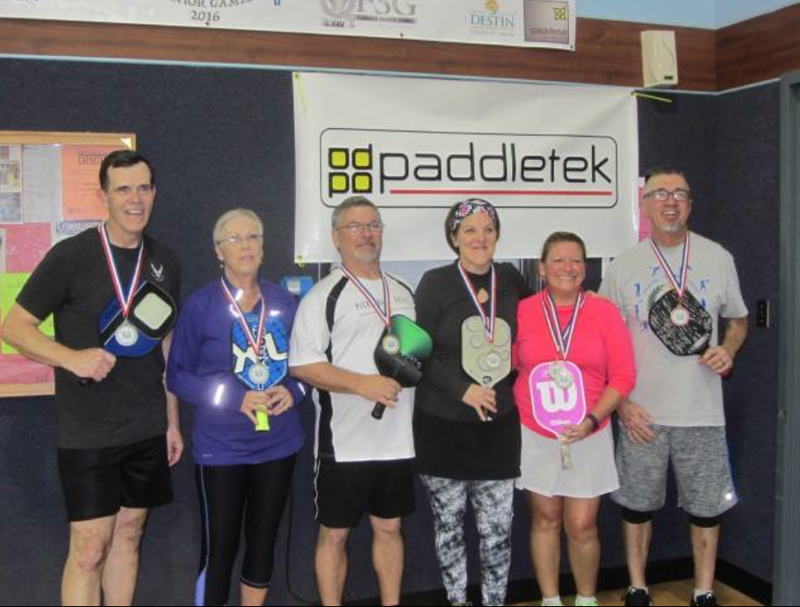 It’s an exciting time for pickleball and the growth of this sport we all love so much. This is an exhilarating time for pickleball! Find out more about the exciting new USAPA Juniors program that was launched this year at Nationals VIII. 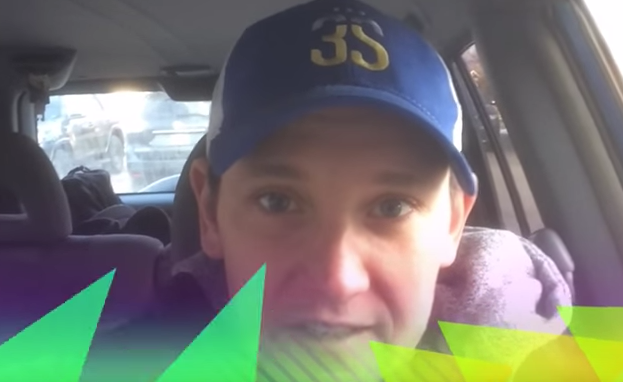 Hear directly from the program coordinator as he talks about the inspiring goals of the USAPA to broaden the sport by adding younger players and empowering groups to develop juniors programs and take pickleball to a whole new level. 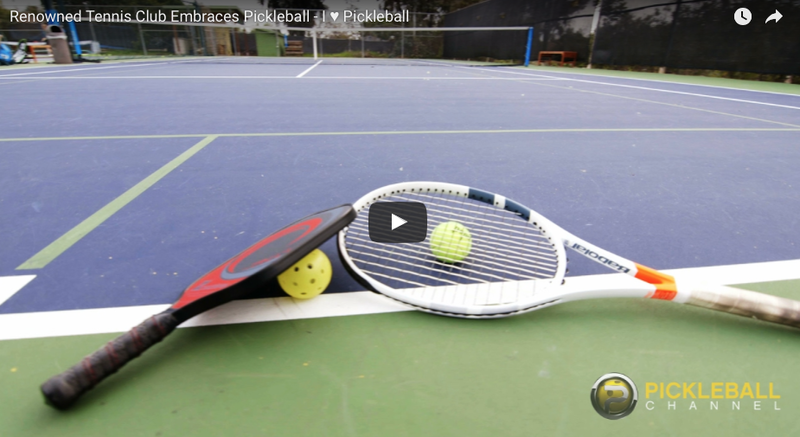 Watch Growing Pickleball Through a New Initiative now. 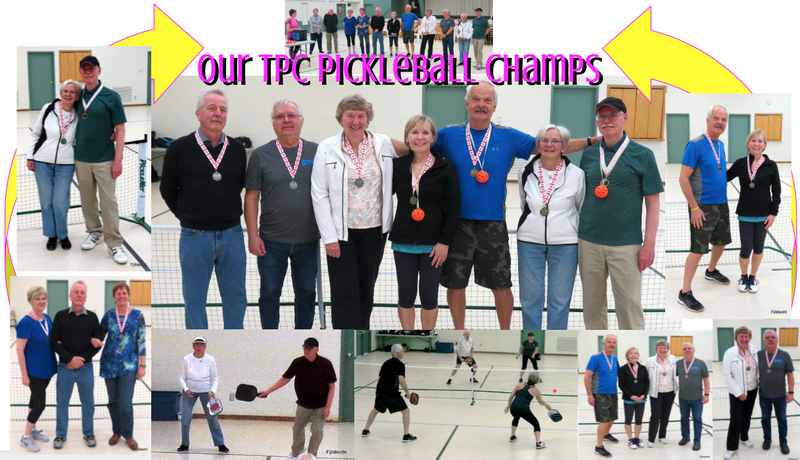 This Mercedes Benz Monterra Pickleball Championship was a 'Just for Fun' Pickleball/Tennis Tournament with Thornbury being the only club representing Pickleball. Although the Tennis Tournament seemed to take priority, the tennis players did get to see a demonstration of Pickleball with Brian Brooks and Garry Milley, the Pickleball Experts, becoming the Overall Champions at the end of the day. Some of the tennis players did get brave and did participate in some of the pickleball matches demonstrating their great tennis moves but learning, too, the suttle differences in the two games. Brian and Garry's first match was against two newbies to Pickleball , so they overpowered their opponents winning 11-1 and 11-0. Their second game against Sharon Emerson and Jean Grummett was a little more of a challenge but they ended up winning again. 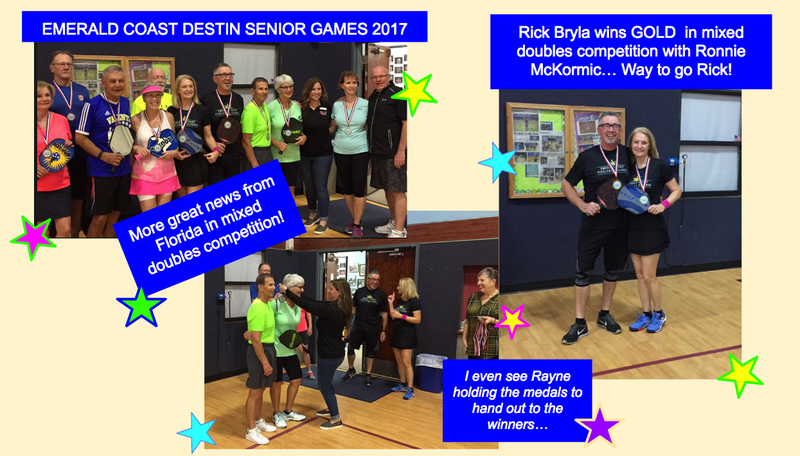 Their final match was a titanic battle against two men who were playing in the tennis tournament as well as pickleball. (One of these players said he was a tennis pro.) Although both matches were back and forth, Brian and Garry made a great comeback to win the second game. The scores of the final was 11-7 and 11-8 for the pickleball experts from Thornbury. Well done! 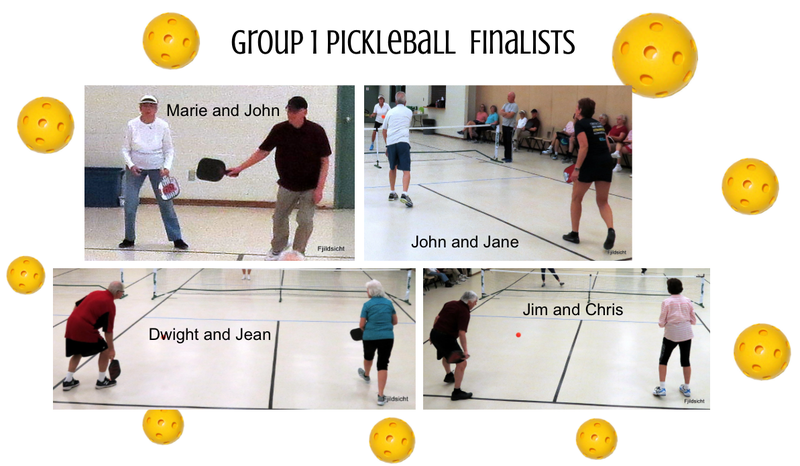 Rob and Jackie began their competition against fellow pickleballer Dwight and a girl who was a newbie to Pickleball and as a result were winners in that match. They then played against Derek and Ray, two tennis players, who found out what losing was all about in their first game against Rob and Jackie. Rob and Jackie held their own all the way with some unbelievable PB moves. However, the tennis players caught on to the game well and went on to win the next two games with their great shots and consistent moves. Although the tournament was unique in its setup, it was a fun experience with some good games and great shots! for the 2016-2017 year are Paul Clements, Harry Stevens, Jean Grummett, Brenda Barron and Sue Boadway. 1. Get to the line! Talk with your partner and decide if there is one person you want to hit the majority of the shots to. This will allow you to pressure your opponents by hitting to their weaker player. <- Here is a video example. 3. Serve and return deep! If you want a backhand that has some power, it is important to use your body. Make sure you set up in a sideways position so you can generate more power! ​<- Here is a video about that. 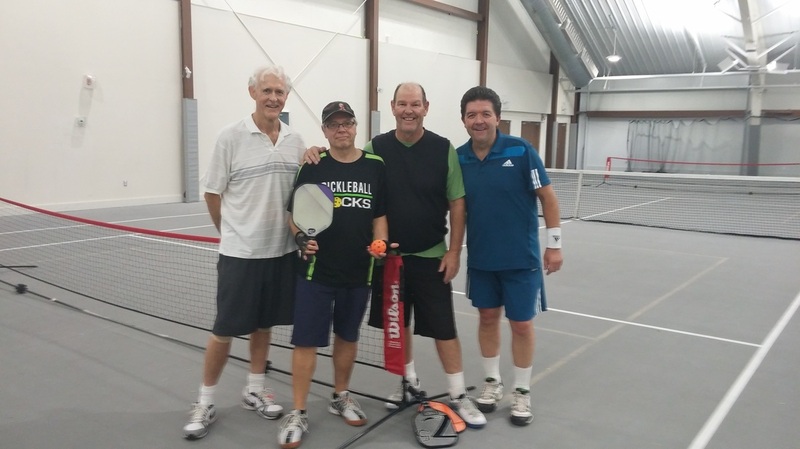 Mark Renneson came to our club April 14, 2016 to give our members more insight into playing the game of pickleball by giving us some INGAME COACHING. People play their normal drop-in/open games but with a twist: there's coaching involved. This coaching is not about technique but is focused on ​highlighting key strategic mistakes/successes in a game-like setting. I would work with the players as they play real games, as well as help the non-players to see things a little differently when they are watching from the sidelines. People are able to ask questions about different strategies as well as get specific feedback during the play. Yeh, Rick! Another Medal Win in Mixed Doubles! ​is a medal winner! Way to go Rick! Members from Thornbury PB Club attended the Provincial Tournament held at the RIM Center, Kitchener-Waterloo in September. Three teams competed in the Mixed Doubles Section - Rick Bryla and Shirley Harrison; Brian Brooks and Rayne Bryla; Catherine Pederson and Larry Mann. 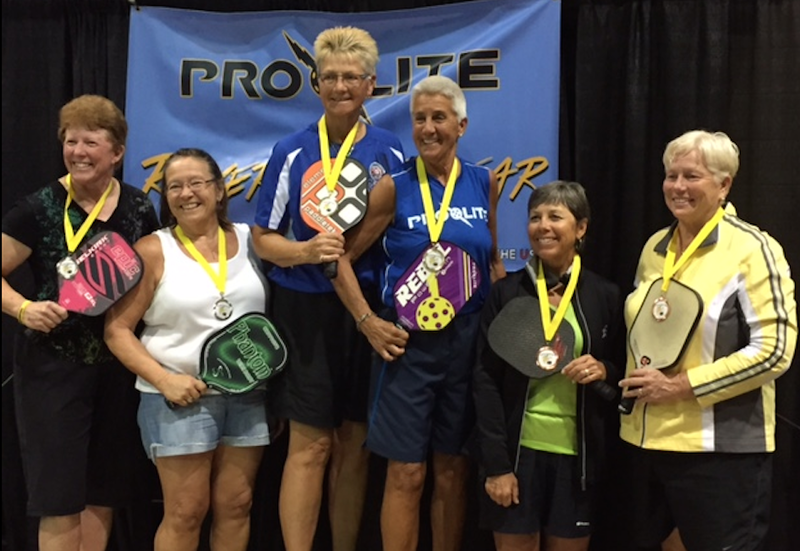 Shirley Harrison and Catherine Pedersen, Jean Grummett and Loan Lanktree competed in Women's Doubles. Congratulations to all on a great learning experience! 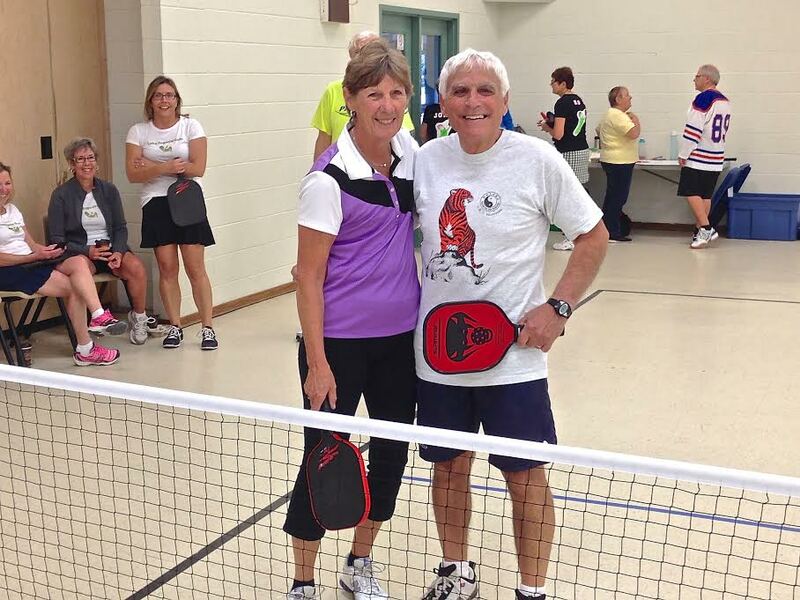 Instructor Mark Rennison, is always ready to help our members improve their pickleball skills. His first lessons were for our members who were beginning to learn the game. Mark visited our location again this week and worked with us for about an hour giving hints on how to improve dinking at the net and how to make our serves more difficult for our opponents to receive. CAN PICKLEBALL BECOME A PAN AM GAME? 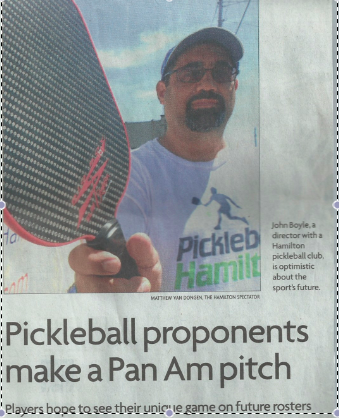 ​News flash: The Hamilton Pickleball Club has been awarded a grant from "All things Pan Am" and will be demonstrating the sport of Pickleball on Pier #4 in Hamilton On. this July. The application was approved on the basis of "increasing awareness of this game and provide and opportunity for people of all socio-economic backgrounds to participate". Promotion of barrier-free activities. Harry and Rosemarie have been invited to demonstrate and represent the Thornbury Pickleball Association. If we make the Hamilton News station CHCH keep and eye out for our advertising sign. 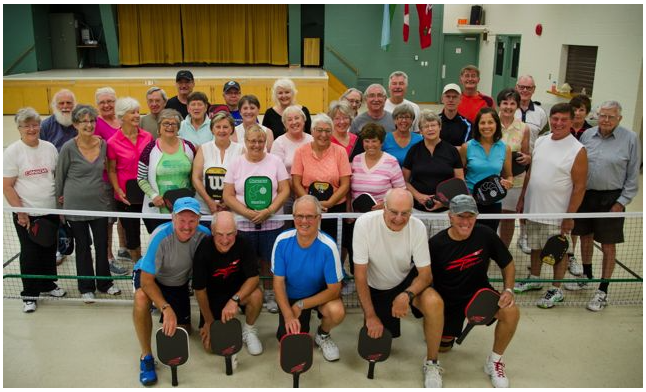 PICKLEBALL MAKES THE PAN AM GAMES IN HAMILTON! Harry Stevens and Rosemarie Wickens joined into the demo in Hamilton. As the soccer fans were walking to the new Tim Horton's Field for the final two days of the competition they could join in to the play or watch at the sidelines. Many fans joined the Hamilton Pickleball club, others were amazed at the enthusiasm for the game. John Boyle, a director of Hamilton Pickleball, told the soccer fans, "If you love sports like tennis, badminton or table tennis, or just like being active, this game can become addictive!" 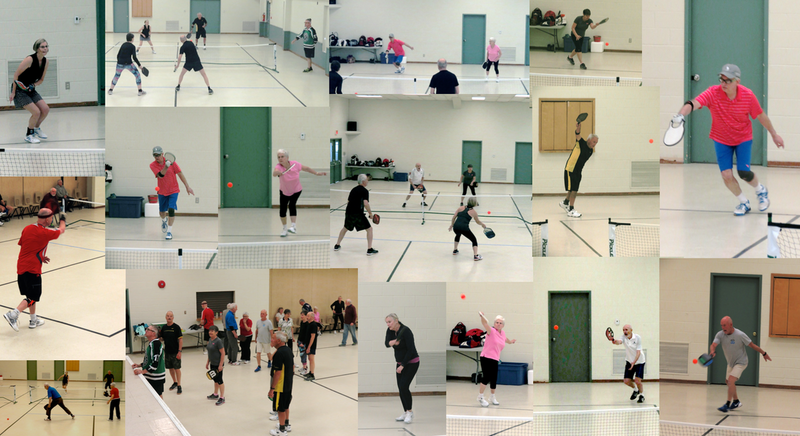 When our club began in March 2014, everyone really enjoyed the physical workout from playing PIckleball! Members also enjoy the camaraderie with their fellow players, but most of all they enjoyed the laughter. Sometimes the competition became challenging and exciting. That's when we realized that we needed to learn more about the strategies and skills of this game. 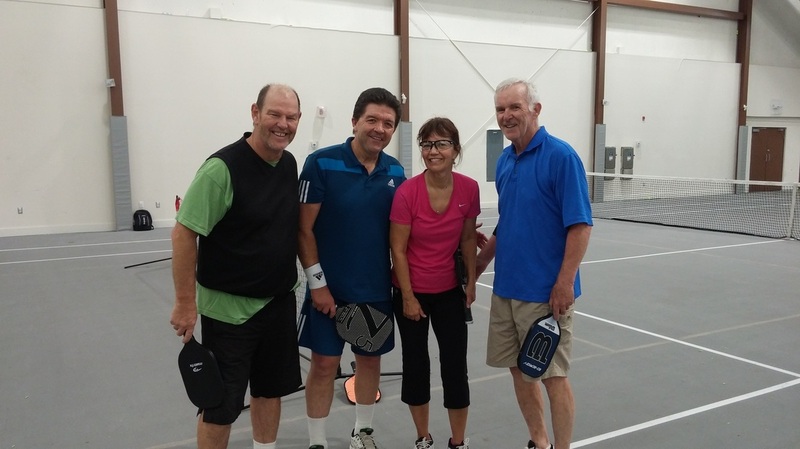 Bill Furse, Paul Brittain and Peter and Sue Singleton (the makers of a pickleball paddle). Everyone learned many new skills to practice and were anxious to include them in the games. October 14, 2014 - Brian Brooks planned all aspects of the tournament, the play teams and their play times. Others decided to have a social after. A great job planning the social was done by Barb Young and Candy Yeandle.